Hire the right professional to build your porch deck or patio. Be sure that the contractor you hire is qualified for the job. O’Leary and Sons are qualified and licensed professionals known for quality jobs. Know what you want ahead of time. This way you can negotiate effectively. Have an estimate of costs and materials before you begin. Be sure to have drawings and charts drawn up. Make sure you understand the ramifications of changing plans or materials. O’Leary and Sons will work with you during this process and talk you through any changes made or miscellaneous decisions. O’Leary and Sons will keep everything running smoothly, from planning, code issues, through completion. If you keep organized with checklists, contracts, charts and illustrations, your deck designs or patio project will run smoothly. Find out about what will end up as a money pit. Use these tips to get your job done correctly, even if you have no prior experience. If you are looking to add more value to your home through curb appeal, or a more usable outdoor space, then adding a deck or patio is a good choice. You will have to educate yourself about the many different aspects of project management. These include: screening and selecting contractors, obtaining permits, zoning laws, choosing a design, having plans and specifications prepared, selecting the site, types of materials to be used, checking for underground utilities, job estimates and the bidding process. * Decks should be sealed right after cleaning. To see if your deck needs to be sealed, place a few drops of water on it. If the water beads up, the deck does not require sealing. If however, the water soaks in, then you must seal the deck. * A dull gray color indicates a possible mold or mildew issue. Try cleaning it with a suitable product. A deck that stays wet for an extended time after a rainfall needs attention. Take proper action to dry it out. 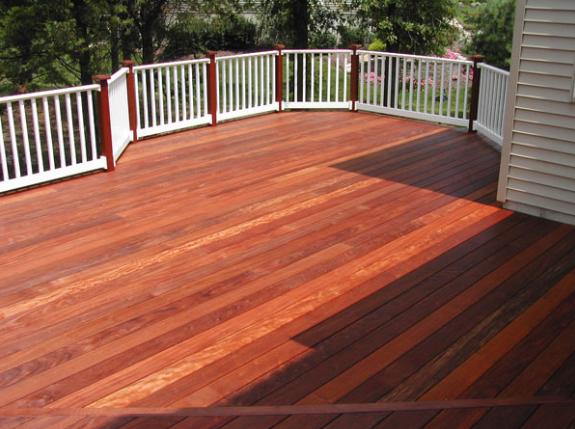 * Remove all debris from the deck surface and spaces between the deck boards. Be sure to check the area where the deck attaches to the house for any hidden debris. O’Leary and Sons will guide you through this process and will take care of these details. Call today for a consultation!